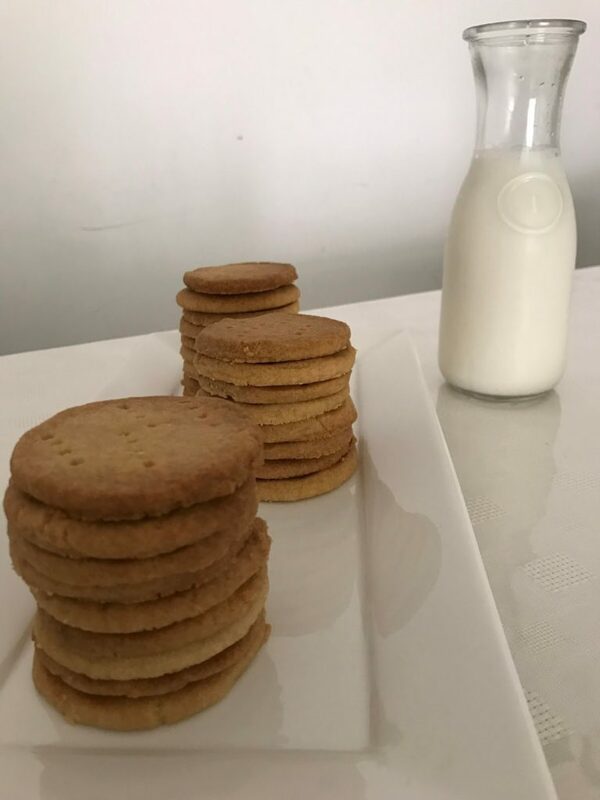 Here’s a perfect buttery cookie that will go well with your hot cup of tea, coffee or plain milk! I made these with whole wheat flour (Atta). You can also replace whole wheat flour with all-purpose flour. These are made from just 3 ingredients. In a large bowl, mix the sugar & butter using your hands or a hand-mixer. It should change its colour to white. Sift the flour and add it to the sugar & butter mixture, until it forms a soft dough. Rest the dough for 15-20 minutes. Make small balls of the dough, press between palm and give it the desired shape with your fingers. You may also use a cookie cutter. I used a tiny round shaped steel box as a cookie cutter. Use a fork to prick the cookie on the top. Roughly, it should be of half a centimetre thick. Bake for 20 minutes or until the cookie turns brown in colour. The above measure will yield 28-30 average sized cookies. Add more sugar if you think the cookie dough is less sweet. Remember every brand of flour acts differently, after resting the dough for more than 20 minutes it shouldn’t be sticky to your hands, it should be relatively dry, i.e. when you touch the dough it should be dry but not very crumbly. If it is too crumbly add 1 tsp melted ghee or more. If you make the cookies with all-purpose flour (maida), you may be able to roll out the dough with the help of rolling pin, but rolling the dough with wheat flour was not possible. You may also use combination of 1 cup all-purpose flour and 1 cup wheat flour. When you just remove the cookies out from the oven, they might be soft. Once they cool down, they will harden. Soni is based in Bahrain, and she blogs at Soni’s Kitchen. She is hooked to cooking since childhood and often helped out her mother in the kitchen. She makes the most of her time baking, blogging, clicking pictures and of course eating different types of cuisines and experimenting in her kitchen. Soni loves to share traditional recipes inspired by her mother, tried and tasted by her family and friends. Soni also conducts basic baking workshops. You can find her on Instagram, Twitter and Facebook.